The Northwest of Curacao is known for its accessibility, pristine shores and great shore diving and snorkeling. The northwest leeward side of Curacao offers many calm shore and boat dives. Its fringing coral reef is in excellent condition and the fish life is divers and numerous. There are plenty of white beaches, pristine bays and palm trees for a relaxing day trip that can include superb snorkeling and scuba diving. 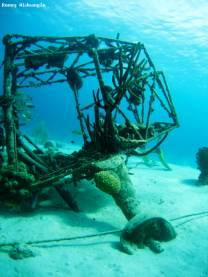 Spectacular dive sites include Watamula, a drift dive around the northern most point of Curacao, Mushroom Forest and the Valley or Port Marie. The northwest of Curacao also offers many inland attractions. The most recognizable feature of the Sheta Boca National Park, is the cave Boca Tabla and the many turtle hatching bays. You can explore Christoffel National Park's stunning nature by foot, jeep or on a horse. Sightings of white-tail Curacao deer, hatching turtles, wild orchids and plenty of birds are common. Hikers have plenty to choose from. From the track to the 375 meter high mountain Mount Cristoffel to the well known long trail Banda Abao, from the Cape Marie Lighthouse to Westpoint (Westpunt), spotting diverse landscapes, remains of former mansions and excellent viewpoints on the way. Popular bays, villages and beaches include Lagun with Playa Jeremi and Playa Kenapa, Boca Santa Cruz, Santa Martha Bay, Cas Abao and Port Marie. More to the south you can visit the flamingo colony and salt pans of Jan Kok. The northwestern side of Curacao is edged with a beautiful fringing coral reef and some of the best beaches on the island.